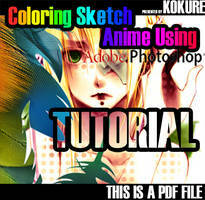 This is a tutorial about lineart used in anime style, which I promised to make months ago. Sorry for the delay. Please avoid putting comments like "This is wrong" "There are better tutorials" "I hate anime". Such unconstructive comments only depress the community and won't do any good. At least, as a pure Japanese, making a tutorial in English needs a lot of effort, and if you are well sophisticated you will understand what it is. 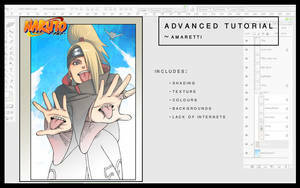 The version of Photoshop used in the tutorial is mainly 6, partly CS. If you use other versions, names of tools/modes and/or allocation of shortcut keys might be different. Here are the links that have been shown in the tutorial. [Eliminate White], is the filter I used in the tutorial. [How to pull out lineart], a comment made by ~siloshadow. [How to pull out lineart], a comment made by ~ladybow69. Please do not forget to show your gratitude to them. does this plugin works for photoshop cs6? I seldom use Deviantart so I press the wrong button. Would you mind deleting this post? Sorry for all the troubles that I made. Hi! I'm a newbie here, don't really know how to use Devian Art. I just want to ask you that how can i watch the tutorial? On the right side of the page, there's a "Download image" button (to be fair, it took me a while to find it initially as well). It should also display "PNG, [dimensions of image, ie 800x9278]"
You're very welcome! I know how confusing it can be to navigate through image sites, and I honestly wish they would put the button directly below the image or something more intuitive like that. this isn't wrong, an anime is awesome. whoever hates anime can shoot theirselves in the face and die n a ditch. it's super cute!! HOW DO YOU OPERATE THESE THINGS??? GAHH! im so useless. Did you click at "download image"? Does anybody know where I can find a PS filter like this one but for CS2? the Elim White I had no longer runs in photoshop newest versions. ALL of your tutorials are extremely helpful, thank u! "If you do lineart on paper, keep it. Ink-it-and-scan-it is better, personally I think." Do you happen to know where I can find the remove white thing for Cs4? How do i see the tips?i clicked on the picture but it won't show. it wont open 4 me!! Open this in a new tab, rather than simply clicking it. It's an issue with dA's new design. I'm probably going to collect all your tutorials. XD Hope you don't mind the lack of comments. Thank You alot this should help me! no offense, but how does this come up when i search '' i hate anime'' ? Looks a tad difficult but it'll help. do you think that you could do this in english plz?